Interesting new article from Rob Dunn’s lab about the microbial and arthopod communities associated with chimpanzee beds. The article itself is clearly pitched within a microbiology of the built environment context… highlighting the fact that we haven’t really looked much a non-human constructed artificial environments. Pretty cool stuff! The indoor environment created by the construction of homes and other buildings is often considered to be uniquely different from other environments. It is composed of organisms that are less diverse than those of the outdoors and strongly sourced by, or dependent upon, human bodies. Yet, no one has ever compared the composition of species found in contemporary human homes to that of other structures built by mammals, including those of non-human primates. Here we consider the microbes and arthropods found in chimpanzee beds, relative to the surrounding environment (n = 41 and 15 beds, respectively). 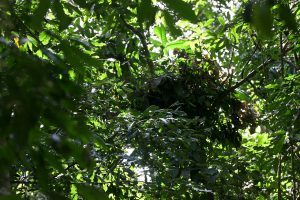 Based on the study of human homes, we hypothesized that the microbes found in chimpanzee beds would be less diverse than those on nearby branches and leaves and that their beds would be primarily composed of body-associated organisms. However, we found that differences between wet and dry seasons and elevation above sea level explained nearly all of the observed variation in microbial diversity and community structure. While we can identify the presence of a chimpanzee based on the assemblage of bacteria, the dominant signal is that of environmental microbes. We found just four ectoparasitic arthropod specimens, none of which appears to be specialized on chimpanzees or their structures. These results suggest that the life to which chimpanzees are exposed while in their beds is predominately the same as that of the surrounding environment.